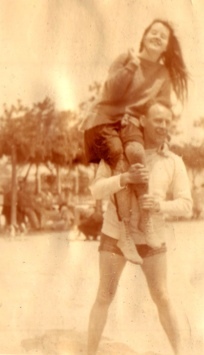 These are my grandparents, Peter and Midge. I never ever, EVER saw this side of them. My grandfather was a judge, who was mostly stern, although not unkind, and my grandmother was a sweet, but very proper lady, and I certainly never saw her up in the air with her hair down. Where did this couple go by the time I came along?? I had a great time, and met some really wonderful people last night. I have the best family! I left my camera up in my room, but hopefully someone else took pictures and will send me copies. For now, here is a poem by Shelley about the passage of time. It’s called Ozymandias. It’s a warning. Hoist your loved ones into the sky while you can!! That poem is one of my Dad’s favorites. I thought you might like this one by Jane Kenyon since sharing poetry is always fun. That is my favorite kind of poem – a reminder that all of this could disappear in a second. Thank you!